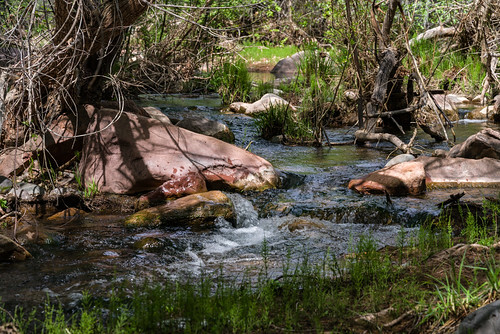 The hike up the Parsons Trail is a pleasant stroll along a cool, clear desert stream set in a magnificent red rock canyon. Sycamore Canyon is a place sufficiently unique to have been one of the first areas protected as wilderness in Arizona. The trail leads through the lower reaches of this wilderness through a riparian area rich in plant and animal life. Colorful cliffs that are a unique mix of dark columnar basalt, red sandstone, and buff colored limestone enclose the lush green of the oasis. The trail leads 4 miles to a large pool called Parson Springs where this considerable stream springs to the surface from the underground course it has followed through the majority of the canyon. Up canyon from this point surface flow only occurs during snowmelt and after summer monsoons. The limestone layer just above the streambed is riven with small caves. Flat ledges of red sandstone extend to the water's edge. Songbirds flit through the tall cottonwoods and thick mesquite bosques. At a number of points additional springs flow from the canyon walls through gardens of columbine and watercress. All these features combine to make this trail one of the most popular, and one of the most crowded, on the forest. If you visit this truly exceptional place please exercise extra discretion in making sure the impact you create is as slight as possible. This trail is part of the Sycamore Canyon Wilderness Southeast Trails. The lower, southern part of Sycamore Canyon Wilderness is managed by the Red Rock Ranger District. Location: 76 miles south of Flagstaff (33 miles south of Sedona) on paved and graveled roads. Access: Drive 65 miles south from Flagstaff on US 89A through Sedona and Cottonwood to the turnoff to Tuzigoot National Monument. Turn north across the Verde River, then left on FR 131. It's about 11 miles to the trailhead. No mechanized vehicles including bicycles in the Wilderness. Fire danger is usually high - be careful with campfires. Camp at least 200 feet from springs and bury human waste 200 feet from springs. Pack out all trash. The Parsons Trailhead is a primary access for multi-day trips into Sycamore Canyon Wilderness when Sycamore Creek has water. Parsons Trail connects to Packard Mesa Trail on the Prescott National Forest for a 5 mile one-way ride. The trailhead is accessible by nearly all horse trailer sizes. Camping is not permitted at the trailhead.